Oy Vay are you going to hear it today… Sadie and I took a little vacation which I had been promising my bagel breaker since January. I took in the sun rays and she spent my clams. Fair deal to me. So before she gets back from playing cards with the Yenta Club, let me bang out my column. Oscar De La Hoya… Where did your balls go? You were a warrior in the ring, but outside, you protect your red headed stepchild like he is a princess. The fight is right with Gennady “GGG” Golovkin, but you seem the only obstacle in its way even though I see young Canelo doing his usual blah blah blah on the internet. If you can’t make this fight, turn in your promoter hat and give it to someone with a sac! Michael Spinks… Champion of the highest caliber. 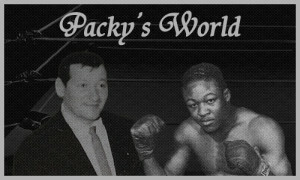 I wish he were around today, he would clean up boxing! Ray Liotta… Ray is a throwback character actor who is even great in the 1800 Silver Tequila commericals. Here are my top five Liotta pictures. My Pal Al (“Bad” Brad’s Father)… If Al who belonged to no party, but voted his own way saw this 2016 political election, he would have a field day. He would tear into Clinton and put Trump out on Front Street. The Chutzpah Award… The Chutzpah Award Posthumously goes to singer and actor Gordon MacRae. He could do it all and is a very underrated singer. I met him a few times when he performed on Miami Beach and he was a true gentleman. RSR Readers we have a contest for the 500th subscriber to the RSR YouTube Channel. Our 500th subscriber will win a personally autographed picture from James “Quick” Tillis. Here is the link to the RSR YouTube Channel to subscribe.